No Red Sonja comic book arc would be complete without a major showdown with a big baddie. 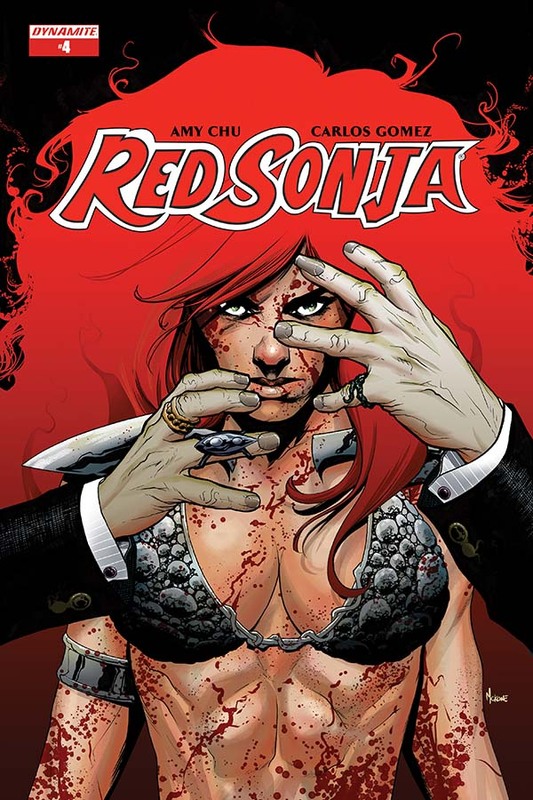 The latest volume, issue 4, is no different as Red Sonja along with Max take on megalomaniac Kulan Gath. It's an all-out battle against demons with some shocking revelations along the way. It's the best issue so far where we get some answers and find out how and why all these people ended up in present day New York. Look away if you want to avoid spoilers now. Gath has joined the very elite of the Big Apple but as a powerful sorcerer, it's been accomplished with a mixture of magic and ruthless entrepreneurship. He's bide his time using his influence to amass an army of followers that have fallen under his spell. Decades passed, Gath waited and schemed until finally Sonja appeared but not alone. Max was out of his time and space too. A victim of Gath too, Max's people and culture destroyed. Sonja had been hired to protect his people but it was too late. Max was young he was transported too and raised in the present day biding his time too. That's why he spoke Sonja's language. Now it was time for his revenge. Gath wasn't going down without a fight and summons a demon to do his dirty work for him. A great battle ensues but it actually gets worse for our heroes. Chu drops a lot of exposition and reveals leading up to the fight and it can seem overwhelming at times but finally filling the holes in these characters' stories helps to add weight to their struggle. Max, for instance, is understandably enraged and his part in this series makes a lot more sense. There are some awkward moments but for the most part issue four overcomes that with a sense of urgency and aggression. An anxiety builds as even the cops outside of the museum are on edge. Carlos Gomez works tirelessly to include many different elements into the issue and have it flow. From the epilogue to flashbacks to the present day, the scope of the issue would be daunting for any artist but Gomez handles it well providing fluid layouts with a lot of detail and emotion. 'Red Sonja' is still one of the best characters, male or female, in comics and this is the kind of issue that personifies her resolve and heroism. Volume four is far from perfect but Chu gets to the heart of Sonja and gives fans what they expect - a fierce but thoughtful warrior. This fish-out-of-water story full of immortal sorcerers and demons is just what the doctor ordered.